Incorporation of real-time synchronized phasor measurements in the control of power grids can play an important role in maintaining the overall closed-loop stability of the power system. In the past, instability in the power grid caused disturbances ranging from small local perturbations to severe large scale blackouts as can be seen from Figure 1. Currently, the synchronization achieved in measurements collected using devices known as supervisory control and data acquisition (SCADA) is not robust enough for efficient monitoring the power grid. Modern power systems can benefit from deploying phasor measurement units (PMUs) as they provide synchronized measurements of up to 60 observations per second in regard to the current state of the system. The operation of PMUs greatly relies on precise time-keeping sources, such as GPS signals, to obtain absolute time for synchronization. However, traditional GPS signals are of low power and unencrypted thereby making them susceptible to external timing attacks. In this article, we propose a novel multi-receiver direct time estimation (MRDTE) algorithm which utilizes the concept of maximum likelihood estimation. This current setup is an extension of our earlier work focusing on single receiver direct time estimation (DTE), described in the paper by Y. Ng and G. X. Gao (2016) listed in Additional Resources near the end of this article. This prior article illustrated and verified the ability of DTE to detect meaconing attacks at an early stage and tolerate high noise levels. This multi-receiver architecture uses the information from spatially dispersed receiver locations to improve noise resilience and reduce the influence of external timing attacks. With an aim to improve the robustness of our time-estimation method, we developed an extension that we named as multi-receiver direct time estimation. We propose the placement of multiple static antennas with pre-evaluated 3D position and velocity at different corners in the same power sub-station. Utilizing the geographical diversity in the receiver locations, the signals from different receivers are collectively analyzed to mitigate the effect of localized spurious signals. In our setup, there are L different receivers that receive GPS signals from N visible satellites at any time instant t. All the receivers are triggered by the same common external clock. Different cable lengths introduce a bias across the receivers that can be pre-accounted for. Thereby, the clock states are considered to be the same across the receivers, as indicated in equation (1). The higher level architecture of the MRDTE described in Figure 2 consists of two major steps. The first step involves applying a novel signal processing technique known as DTE. In the second step, known as MRDTE filter, the DTE outputs obtained from the receivers are collectively processed through an overall kalman filter. The corrected overall clock vector Tt,overall at any time instant t obtained as the output from MRDTE, is given as input to the PMUs. This strategy is adopted to reduce the search space from 8L (Xt,k, Tt,k) to 2 (Tt,overall), thereby increasing the robustness and decreasing the computational complexity. DTE estimates the cumulative satellite vector correlation of the raw received GPS signal with the signal replica produced from each grid point gj = [cδtj, cδṫj] in a pre-generated 2D-search space (total M grid points). Taking the 3D position and velocity of the static receiver as the a priori information, the most plausible clock state of the receiver is evaluated based on the principle of maximum likelihood estimation, as shown in equations (2) through (4) (see inset photo, above right, for equations). Correlations are performed on a per satellite channel basis to obtain the correlation amplitude with respect to the code residual in Figure 4a while fourier transforms are carried out in parallel to obtain the spectrum magnitude with respect to the carrier doppler residual as shown in Figure 4b. Non-coherent summation of the correlation amplitudes and spectrum magnitudes is computed respectively across the N visible satellites. These obtained summation of correlation values are allocated as weights that represent the likelihood of a particular gj in the 2D-search space. MRDTE Filter. After obtaining, the measurement error vectors ek for each of the individual receivers, an individual receiver level measurement update Tt,k is done using a kalman filter. The next stage involves incorporating the individual receiver corrected clock parameters Tt,kk into an overall kalman filter to obtain the final corrected clock state Tt,overall corresponding to the common shared clock. The prediction of the overall and individual receiver states for the next time instant t+1 is achieved by linearly propagating the clock parameters based on the first order state transition matrix. Initialization of MRDTE. The initialization T0,k for each receiver can be done using any commercial techniques like scalar tracking etc. or by considering an optimum initial search space. Given that power grid is a static system, the receiver locations can be accurately pre-determined using the already available off-the-shelf techniques and averaged over time to get the best 3D position and velocity estimate. To evaluate our MRDTE approach, we set up a field experiment, as described in the following section. Hardware setup. We validated the robustness of the proposed multi-receiver DTE using four GNSS antennas mounted onto the roof of Talbot Laboratory, University of Illinois at Urbana-Champaign, as shown in Figure 5. The antennas are connected to a common chip scale atomic clock (CSAC), chosen for its low drift rate, to form a receiver network, and the raw voltage data are logged using respective universal software radio peripherals (USRPs) each equipped with a daughterboard as in Figure 6. Software Setup. GNUradio, a free opensource software development toolkit that provides signal processing blocks to implement software radios, was used for collecting the raw GPS L1 signal samples from USRP at a sampling rate of two megahertz. 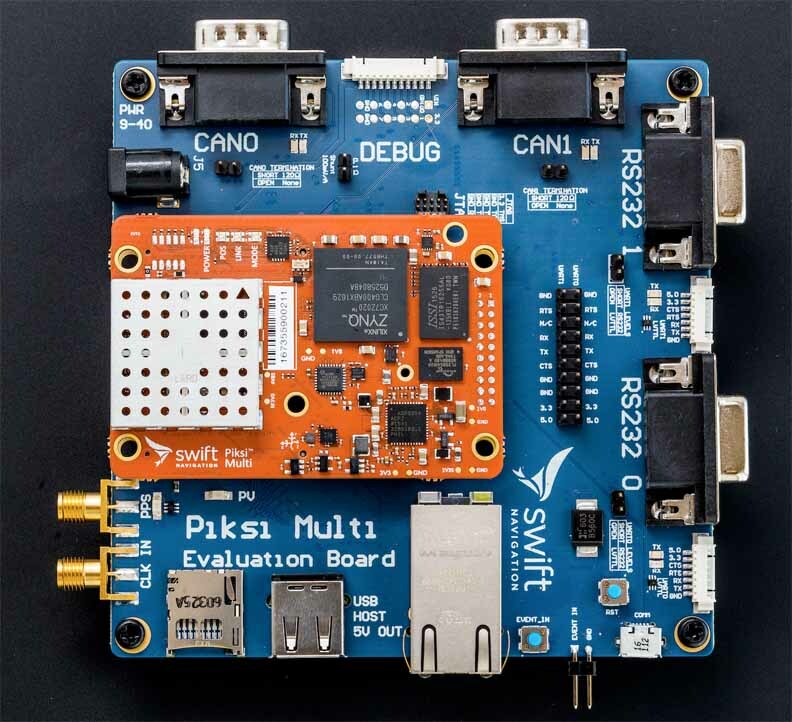 We chose to implement this technique in the python software-defined radio developed in our lab (pyGNSS), given its flexible and object-oriented framework. In our case, the 3D position and velocity of the receivers are calculated using multi-receiver vector tracking as described in the article by Y. Ng and G. X. Gao (2015) listed in Additional Resources. For the vector correlation, we opted for a coherent integration time of ΔT = 20ms. The measurement noise covariance matrix is evaluated using the covariance of the last 20 individual measurement residuals. Virtual timing attacks, which include jamming and meaconing, are simulated and added onto the field data collected after which they are processed using MRDTE as discussed previously. While subjected to these external attack scenarios, we test the performance of MRDTE to that of conventional scalar tracking. Jamming. Jamming involves broadcasting a high-power noise signal near the GPS frequency range thereby causing the GPS receivers to lose track of the signal being acquired. The conditions of jamming are generated by adding white Gaussian noise Aej2πΦt onto the incoming received signal. This noisy signal includes two components: random amplitude A, which is a measure of the strength of the noise being introduced and random phase Φ. Figure 7 is indicative of the robustness of the MRDTE algorithm. In the presence of 12 decibels added noise, the scalar tracking loses track. However, the MRDTE still successfully tracks the signal accurately. In Figure 8, the clock bias and clock drift residuals are compared for added noise with respect to the signal noise floor. In the presence of 5 decibels of added noise, the clock bias is estimated with an error of within 10 nanoseconds and, in the case of 12 decibels of added noise, within an error of 100 nanoseconds. Thus, a more robust clock state is estimated by implementing MRDTE algorithm. Meaconing. In this case, a replay signal with similar GPS signal structure and signal power two decibels more than that of the authentic signal is added onto the incoming GPS signal. The first 36 seconds correspond to that of scalar tracking and after which the spurious signal is introduced represented by the thick black dotted line. At this point we turn on the MRDTE algorithm and compare its performance to that of scalar tracking for the next 30 secs. When meaconing starts, the scalar tracking locks onto the counterfeit signal as shown in Figure 9 whereas the MRDTE still consistently tracks the authentic signal thereby mitigating the effect of meaconing attack. This article proposed a novel MRDTE algorithm for secure and robust GPS time transfer using multiple static receivers sharing a common external clock. We leveraged the information redundancy and the known 3D positions of receivers to improve the robustness of the system. We implemented MRDTE using commercial available front-ends and our software platform PyGNSS. Through simulations of timing attacks based on GPS signals collected in field experiments, we demonstrate MRDTE’s increased resilience against jamming and meaconing attacks. This material is based upon work supported by the Department of Energy under Award Number DE-OE0000780. This report was prepared as an account of work sponsored by an agency of the United States Government. Neither the United States Government nor any agency thereof, nor any of their employees, makes any warranty, express or implied, or assumes any legal liability or responsibility for the accuracy, completeness, or usefulness of any information, apparatus, product, or process disclosed, or represents that its use would not infringe privately owned rights. Reference herein to any specific commercial product, process, or service by trade name, trademark, manufacturer, or otherwise does not necessarily constitute or imply its endorsement, recommendation, or favoring by the United States Government or any agency thereof. The views and opinions of authors expressed herein do not necessarily state or reflect those of the United States Government or any agency thereof. Closas, P., and C. Fernandez-Prades, and J. Fernández-Rubio et al., “Maximum likelihood estimation of position in GNSS,” Signal Processing Letters, IEEE, vol. 14, no. 5, pp. 359–362, 2007. Ng, Y., and G. X. Gao (2016), Robust GPS-Based Direct Time Estimation for PMUs in Proceedings of the IEEE/ION PLANS conference, Savannah, 2016.